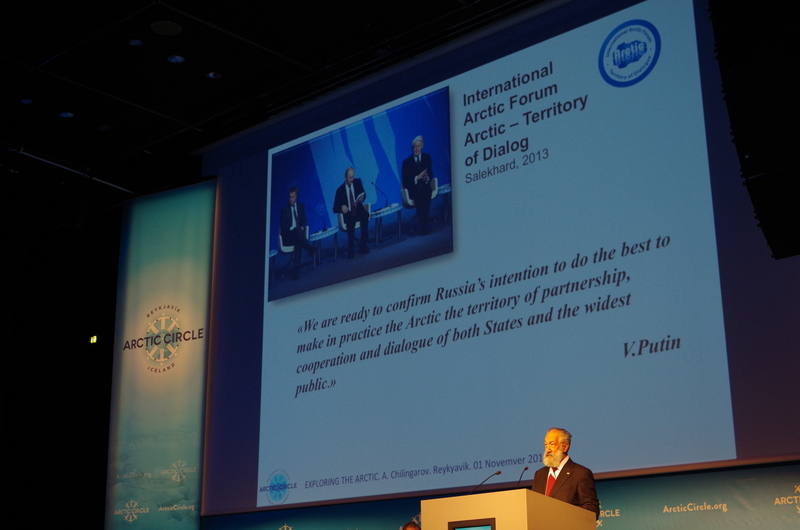 Russian Polar Hero Artur Chilingarov speaks at Arctic Circle 2014 in Reykjavik, Iceland. If 2013 was a year of expanded Arctic cooperation, perhaps best highlighted by the acceptance of five Asian states as observers in the Arctic Council, then 2014 was a year of strained Arctic cooperation. While the fallout over Russia’s incursions into Ukraine and its annexation of Crimea did not cause multilateral diplomacy in the Arctic to grind to a halt, it did put it under severe pressure. Meetings of the Senior Arctic Officials still took place, but the mood at times was frosty, particularly when Canada boycotted one such meeting in Russia. The Arctic may now be a “global Arctic,” but that comes with a price. Events that kick off in Kiev can have severe knock-on effects in the Kara Sea, where U.S. sanctions forced ExxonMobil to withdraw from its joint project exploring for offshore for oil with Rosneft. Strained is thus the word I chose to sum up the Arctic in 2014 when interviewed by Eilís Quinn, who manages Radio Canada International’s Eye on the Arctic media project. I recently spoke with her for a radio program reviewing the events that transpired in 2014 in the Arctic. You can listen to the interview here. Listen to the show for a more in-depth discussion of those three developments in the Arctic, along with other questions such as the most under-reported story in the Arctic in 2014.